ON 28th February this year, Union Ministry of Home Affairs of the Central Government of India issued Notification under Sub-section (1) and (3) of Section 3 of The Unlawful Activities (Prevention) Act, 1967 (37 of 1967). Under the said Act, Jamaat-e-Islami Jammu and Kashmir was declared as “Unlawful Association”. Relevant Notification issued for this purpose directed that this Notification shall, subject to any order that may be made under Section 4 of the said Act, have effect for a period of five years from the date of publication in the National Gazette”. The ban came into force following February 14, 2019 terrorist attack in Pulwama (J&K) in which 40 CRPF Personnel were martyred. Thereafter, arrests of its leaders including activists are being made throughout the State. For every patriotic citizen of the country, the after affect of the ban is sending shivers down to their spines after realizing that this dreaded unlawful organization has been able to spread its tentacles throughout not only all the districts of Kashmir Valley but also every district of Jammu Region too which includes Jammu, the city of Temples. It is quite possible its dreaded viruses may have covered most peaceful region of Ladakh also. Going to the history of this banned organization, it is found that its parent organization known as Jamaat-e-Islami Hind was established before partition in 1945 in India. In 1952, Jamaat-e-Islami Hind decided to separate its Kashmir Branch on the ground that territory of J&K State has an alleged disputed status. Accordingly, a separate wing was established under the name of Jamaat-e-Islami J&K. Legal formalities were completed in November 1953 under the leadership of Maulana Ahrar and Ghulam Rasool Abdulla. Both of them had drafted its Constitution. It is indubitably stated here that in 1953 Sheikh Mohammad Abdullah was dismissed from the high position of Prime Minister of the State of Jammu and Kashmir followed by his simultaneous arrest on the charge of conspiring with western powers to become independent Sultan of Kashmir. After his arrest (in 1953), Sheikh Abdullah without allowing any grass to grow under his feet founded his political organization known as J&K Plebiscite Front which under the above said Central Act was declared “Political organization of secessionist nature”. The declaration was made under SO 227 dated 12 January, 1971 which was published in the Gazette of India Extra Ordinary Part-II. The aims and objects of this political organization have been delineated at pages 340 and 341 of book authored by me under the title “Plight of Jammu & Kashmir-the unknown files”. The then Chief Justice of Jammu and Kashmir High Court Late S. Murtaza Fazal Ali under the provisions of the above said Act was appointed by the Central Government of India as Chairman of the Unlawful Activities (Prevention) Tribunal. The Tribunal held its proceedings in Delhi. The full text of the hotly contested judgment is published in the aforesaid book at Pages 342 to 345. By way of co-incidence or otherwise under some nefarious designs recently declared Unlawful Organization (Jamaat-e-Islami – Jammu and Kashmir) also raised its ugly head to sow seeds of separatism in the State of Jammu and Kashmir in that very year i.e. 1953. In the above stated Notification the Central Government has, in brief given the reasons:- “Jamaat-e-Islami J&K (hereinafter to be referred as J-e-I) is supporting claims for secession of a part of the Indian Territory from the Union and supporting terrorist and separatist groups fighting for this purpose by indulging in activities and articulations intended to disrupt the territorial integrity of India,” The Notification further says that if not banned it would continue advocating secession of the State of J&K from the Union of India while disputing the Accession. In its history, for the first time, J-e-I had to face ban in the year 1975 during “national emergency period” when Sheikh Mohammad Abdullah after entering into accord with Smt. Indira Gandhi was ruling the State as Chief Minister and that accord had brought back the Sheikh Abdullah’s National Conference Organization into the mainstream politics. Sheikh Abdullah got an opportunity to impose ban in the State because in the rest of the country Smt. Indira Gandhi after the promulgation of ‘Emergency’ had also imposed ban on RSS. Sheikh Abdullah, had realized threat of his existence in the State as an unchallenged ruler from J-e-I, and for this reason he availed the opportunity to curb the activities of Jamaat-e-Islami. It was a short-lived ban because, after the lifting of the ‘Emergency’, the elections were held throughout the country and Smt. Indira Gandhi lost the power. The second ban was imposed by the Central Government of India in the year 1990 when Sh. V P Singh was the Prime Minister and Sh. Jagmohan was the Governor of the J&K State and the State was under Governor’s Rule. This ban was imposed not under the Central Act but under the Jammu and Kashmir Criminal Law Amendment Act of 1983. Jamaat-e-Islami J&K was declared to be an ‘Unlawful Association’ by Notification SRO 146 dated 16 April, 1990. The writer of this write-up was appointed as the Chairman of the Judicial Tribunal which was established under the above stated Act to go into the legal veracity of the administratively issued ban within a period of two years. The ban had to expire thereafter within three years. Initially, the Tribunal had its two other members namely, Qazi Muzafar-ul-Din and Sardar Harcharan Singh Bahri. The members were of the cadre of District and Sessions Judges junior to me. At that time, I was the Senior District and Sessions Judge and placed in Special Grade. The first senior member was a Kashmiri Muslim, who initially attended one or two meetings in Jammu where Head Office of this Tribunal was established. Mr. Qazi received constant threats to his life and to his family members from the militants and he showed his inability to me to continue as member in those prevailing circumstances. I too experienced such type of threats but did not succumb. I conveyed the oral request of Mr. Qazi to the then Governor (Late Shri Garesh Chander Saxena) who appointed Shri Harbans Lal, District & Sessions Judge as second Member in place of Mr. Qazi. The Tribunal thus became functional and proceedings started. The plaintiff State in the plaint filed before the Tribunal was accompanied by voluminous record consisting of the details of some international and prejudicial activities, copy of the Constitution of the Organization, lists of schools, battle orders, extract of relevant DISIS which means Dosiers. In the plaint, the government had arrayed J-e-I as Defendant No. 1, Hakim Ghulam Nabi S/o Mubarak Shah R/o Muloo Chitragam-Shopian as Defendant No. 2. Defendant No. 3 was Mohammad Ashraf Sahrai and Defendant No. 4 was Syed Ali Shah Gelani. Service of the summons issued by the Tribunal could not be affected on Defendant No. 2 as he had gone underground. Defendant No. 3 after filing the counter to the plaint did not take part in the proceedings whileas, Defendant No. 4 Syed Ali Shah Geelani who is being projected as leader of the Association contested this case. Mr. Geelani was lodged in Central Jail Naini (Allahabad now Prayagraj). The Tribunal held its proceedings on February 19, 1991 in the premises of above Central Jail Naini where all the relevant record of the case was handed over to him for filing the counter which was received in the Head Office of the Tribunal at Jammu on March 27, 1991. Defendant No. 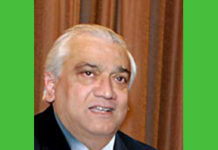 3 – Ashraf Sahrai on September 4, 1991, had informed the Tribunal not to take part in the proceedings. Meanwhile, Mr. Geelani Defendant No. 4 was shifted to Tihar Jail, Delhi. Further proceedings were held in the premises of Tihar Jail Delhi. Specially a Court was established within the Jail premises. Mr. Geelani had personally appeared along with his Advocate Mr. M.H. Baig, who remained “Dy. Chief Minister of coalition Government of Cong-I & PDP and presently is the Member of Indian Parliament”. On the request of learned Advocate, the case was adjourned as he had made a request that he had to go through the record and the next date was fixed for September 7, 1991. These proceedings were resumed in the premises of Tihar Jail Delhi. Mr. Baig (Advocate) had made written as well as oral statement that Mr. Geelani onwards do not wish to take part in the proceedings. The plaintiff state in the accompanying Dosiers with the plaint in detail enumerated 48 incidents in seriatim showing the anti-national activities of the said Organization. between different religious groups of the State. The activities of the Association had been causing fear, alarm and feelings of insecurity amongst different religious groups and communities in the State by exhorting the general public to observe frequent hartaals. The Association had been interfering with the maintenance of supplies and services essential to the life of the people at large. Furthermore, the aims and objects of the Association are also to earn the odium of the people in general against the established government by levelling unsubstantiated charges of atrocities. These activities resulted in the interference with the public administration, administration of law and the maintenance of public order. The aiding, undertaking and the propagating of the above stated feelings, cults, objective, claims etc as stated above by the Association in question or by its office bearer or activists fall squarely within the ambit of Section 2(b) and (c) of the Act as being the Commission of ‘Unlawful’ Activities by the Association in question. For the reasons given above, the reference is accepted and the declaration that the Jamaat-e-Islami J&K is an ‘Unlawful Association’ made in the impugned notification number 146 dated 16 April 1990 is hereby confirmed. Let the copy of the judgment be sent to the Home Secretary, Government of J&K Jammu. Let the records of the case be also sent to the Home Ministry for safe custody. Before parting with the judgment, we are constrained to observe it with a sincere hope that militancy in the Kashmir Valley – a heaven on this earth would end sooner than expected. Violence is no solution to any problem. It only breeds hatred and adds to the miseries of innocent common people. The unity and integrity of the country must be preserved at all costs. It is above politics, above individual gain and above the interests of one group or another. It is fundamental to the prosperity of the nation as a whole. Communalism is an extremely dangerous virus, India is a multi-religious nation and communalism adds to the miseries of all. Much of our nation’s energy and resources have to be diverted to the containment of communal violence. The nation can ill afford this. And lastly, let there be no doubt that India belongs to all of us, we are citizens of this great country. All of us to whatever religion we may belong are equally the children of India with equal rights; privileges and obligations. Let us all play our role to fulfil the basic objections of our Constitution which include strengthening communal harmony and national integration. At the end, I, in my personal capacity being a citizen of India, would say that democratic setup as established under the Constitution of India, it is only the people of the country who are Sovereign. They have fundamental authority to ask the elected members both from the State legislature as well as in the Parliament why they failed to follow the mandates of law when J&K Public Safety Act (PSA) mandates that all assets of a judicially confirmed unlawful Association are to be confiscated and its activists require to be prosecuted? Rather, phenomenal spread of this Unlawful Organization was allowed which have now spread their roots in every district of the State of Jammu and Kashmir. On the contrary, those people who have ruled the State as elected heads of the Executive are giving their verdicts about the legality on the ban in question. Its legality or illegality under the Central Act still awaits the judicial verdict of the Tribunal to be yet established by the Central Government. The concerned party/parties can contest the case before the Tribunal. I would remind the concerned people about the ancient wisdom of our Rishis who thousands years ago before the dawn of modern Western civilization had realized that every action of the State is maintainable before the court of law. Sanskrit translation done from the concern text is reproduced: – “The Law is the King of Kings more powerful than they are because with it’s prowess as that of the highest monarch the weakest shall prevail over the strongest”. The sum and substance of this legal adage is about supremacy of rule of law and equality of everybody before law. These principles are recognised in Indian Constitution as fundamental Rights. Besides, their essence pervades in some Natural Human Rights recognized throughout the world fora.